White paper on crime 2004 Part1/Chapter5/Section1. Fig. 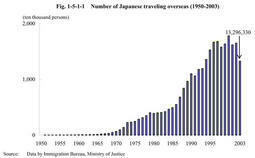 1-5-1-1 shows the number of Japanese traveling overseas from Japan since1950. The number of Japanese traveling overseas decreased by3,226,474(19.5%)from2002to13,296,330in2003,the largest year-over-year decline since1950.Males accounted for57.2%and females for42.8%of the total.Most of them were persons aged30-34years at12.4%,followed by those aged25-29years at12.1%and those aged35-39years at10.2%. (Source:Data by Immigration Bureau,Ministry of Justice). Among Japanese nationals residing overseas, Fig. 1-5-1-2 shows the number of"permanent residents",and"long-term residents"who stay for three months or more(they are collectively referred to as"Japanese overseas residents").Permanent residents have been on a moderate rising trend since1994,except for a slight decline in2002,whereas long-term residents have been on a significant rising trend,including a5.5%increase from the previous year in2003.